Deadlines, requirements, profiles and professional backgrounds. 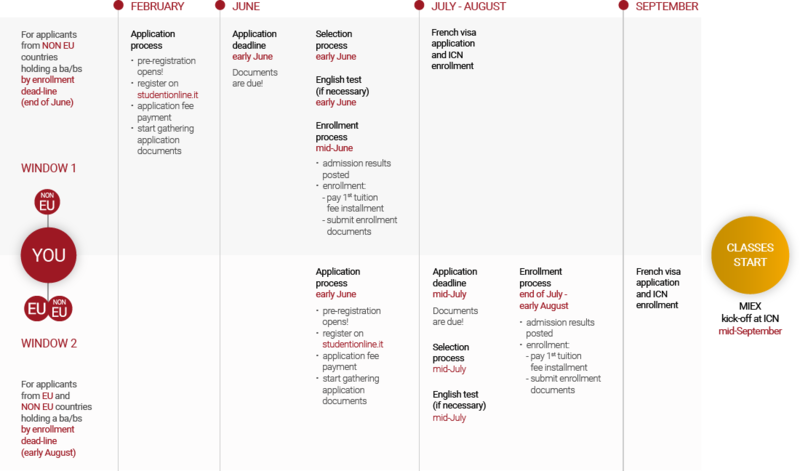 Applying to MIEX is a big step and we’d like to help you in your decision-making. Get in touch with us as soon as possible, so we can help you tailor your MIEX experience to reflect your career goals and assist you in perfecting your application. Each year applicants from a wide variety of cultural, personal and professional backgrounds apply to join MIEX. While each MIEX student and each MIEX Class (Edition) is unique, there are certain qualities they share: they are driven, open-minded go-getters, hungry for new experiences who bring to the table a curiosity that promotes depth and a strong work ethic mixed with a healthy dose of daring ambition. Knowledge of other foreign languages: Arabic, Chinese, French, Hindi, Italian, German, Japanese, Portuguese, Russian and Spanish will be considered preferential as well as an outperforming academic track record. Due to MIEX’s modular structure, overall tuition fees change based on the student’s study plan. (UNIBO Master di I Livello + ICN MSc in International Management + Third Degree): Year One € 8,600 + Year Two € 4,000 + possible additional fees depending on host University. MIEX Tuition Waivers: The UNIBO MIEX TEAM offers a select number of partial tuition waivers awarded to the top students of each MIEX selection window. Business Networks Scholarships: The Scientific Board of the Master is active in raising additional scholarships offered by partner companies and/or sponsoring bodies. Unicredit Loans: Following an agreement between the University of Bologna and UniCredit Banca, participants are offered the possibility to apply for “UniCredit ad Honorem” fiduciary soft loans, available for both Italian and non-Italian citizens, residing in Italy. These loans are also awarded for candidates who may be awarded a scholarship. For more detailed information please visit the main University of Bologna website “UniCredit ad Honorem” fiduciary soft loans.